'Even the tiniest children are being used as these political footballs'. Children at the Windrush Nursery in Greenwich, south east London. John Stillwell/PA Images. All rights reserved. On Thursday, 18th May, schools in the UK will be gathering personal data from children aged 5-19 for the National Pupil Database (NPD), which records information about children's nationality, ethnicity and country of birth. The further penetration of policing into schools builds on a systematic effort to create hostile environments in the lives of people the state seeks to remove. Giving this information is not mandatory. Refuse to give this information. You are under no compulsion to comply. Boycott the census. Withdraw any information that has so far been gathered. You can retrospectively decide not to participate in the school census as long as it is before Thursday 18th May. Resist the surveillance of children, migrants and all people, by getting involved in politics locally and campaigning against state racism. 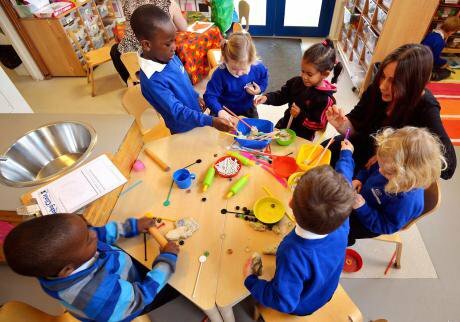 Schools campaign group Against Borders for Children (ABC) have already helped to successfully ward off attempts to collect data from children aged 2-5 in early years education. If enough people refuse to participate in Thursday’s census, the group will have helped to avert further invasions, rejecting stark militarisation in the lives of young people. “In this country, certainly since the 60s there's been a whole series of ways of actively racialising children in schools,” she says. “As Bernard Coard famously says, West Indian children are made educationally subnormal… that's sadly been a core aspect of UK schooling – probably since the institution of popular schooling in this country, certainly since the ‘44 act,” says Bhattacharyya. Last year leaks revealed that the Home Office under Theresa May tried to enforce a policy which would de-prioritise children on the basis of their citizenship, withdrawing places from children whose parents were seeking asylum in the country or whose documentation was otherwise irregular. In the wake of a massive hack of NHS computer systems, it is also clear that inadequately funded services cannot protect citizens’ intimate data – data the state is gathering more and more actively. But this is not to imagine that hackers would be using families’ information for any more harmful ends than immigration enforcement themselves. Refusing to take part in the census gives a real-world meaning to a left-wing ideal of ‘not being complicit’ in the structures of oppression. It is especially important that parents of children who were born in this country or with secure immigration status boycott the census. This would make data unusable because it would mean that people were not identifiable purely on the basis of abstention. Refusing to take part in the census gives a real-world meaning to a left-wing ideal of ‘not being complicit’ in the structures of oppression: people in strong positions can quite literally lessen the burden on those made precarious by structural racism through refusing to take part. The Immigration Act 2016 made border guards out of ordinary people. Employers of migrant workers can now report employees for the crime of “illegal working”; landlords are to check the immigration status of potential tenants and will face up to five years in prison for refusing to do so; newly invasive powers enable immigration enforcement to search property and seize documents, to stop migrants from driving, and to freeze or close bank accounts. Migrants across the board now have to appeal their case out of the country, which makes the task of appealing far harder. For those that are really at the hard end of state violence it confirms their sense that you can't reach out to other people, that your space of operation gets smaller and smaller, that your life becomes more and more unseen. Bringing the border closer to home “does in the day-to-day it makes people frightened, and it is designed to do that. The people who are most vulnerable feel most frightened because they're not hearing other people say, ‘Oh, this is just ridiculous, I can't do that’. They just hear the state injunction to shop people." "If you don't participate in state policing, then you yourself become the object of policing. And I think that sadly does work to corrode trust and solidarity between people. And it works unevenly,” she says. "Sometimes the overreach of the state can be helpful to us because they reveal themselves so openly. And I wonder sometimes if even Prevent has been a little like this, that it's been so overblown in its claims, of how broadly suspicion should be framed and how limited our knowledge of what it should be based on is." With thanks to Ella Milburn for her work on the piece.